There’s when things end and then there’s when we physically leave, and the two rarely coincide. Sometimes it takes six months, a year, or even longer for our body to catch up with our brain. Knowing when to leave a job, a relationship, and even a party is a skill. If you’re unhappy at work, have asked for what you want, and know you can’t it where you are, develop an exit strategy and act on it quickly. When you’re checked out, people know. Unhappiness shows up in our performance, attitude, and body language. And quitting and staying is bad for your career, reputation, and business relationships. Do your job and do it well. Don’t go missing in action. Only commit to things you know you can and will do, and keep your commitments. Confide in people about your unhappiness and future plans who are outside your current place of work. People talk. Assume anything you tell someone at work will be told to someone else. Take at least one action every day towards getting what you want. It can be easy to get into a rut when job hunting. Stay in action. If you’re unhappy at work, it’s probably time for a change – either within or outside your company. Ask for what you want in a positive way. Do a great job on a daily basis, regardless of how you feel. 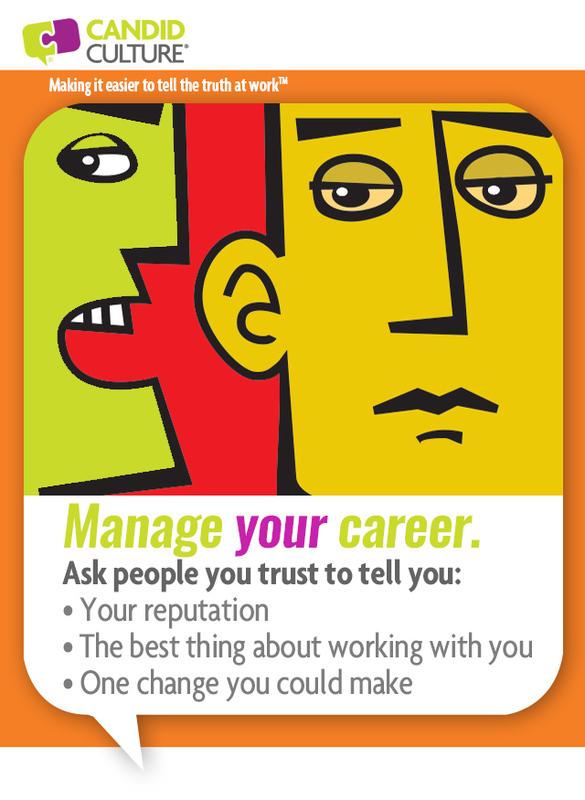 Confide in people outside of your workplace. And take one action every day towards getting what you want. At some point, you’ll get passed over for a promotion, project, or piece of work, and no one will tell you why. Why should they? There is little incentive to deal with your likely (human and normal) defensive response. It’s easier to say nothing. The problem is that this lack of information gives you no ability to manage your career. Most people get almost no feedback at work. “Good job” isn’t feedback. Neither is, “You seem distracted.” And being told, “You just weren’t the right fit,” is utterly unhelpful. If you want to manage your career, you need more information. Getting this information might seem scary. You might be thinking, “What if I don’t want to hear what people have to say? What happens if I hear something really bad?” People are so hesitant to give feedback, they’ll be ‘nice’ to you. You won’t hear anything you can’t handle. There are people in your life who will tell you the impression you create, what you’re like to work with, and why you might not have gotten a job you really want. They’ll tell you, if you ask and make it safe to tell you the truth. Making it safe means you can’t defend yourself. No matter what the person says and how hard it may be to hear, you must respond with, “Thank you for telling me that,” even if you’re convinced they’re wrong. The easier it is to give you feedback, the more feedback you’ll get. The harder it is to give you feedback, the less you’ll get. Remember, no one wants to deal with your defensive response. It’s easier to say nothing. Identify five people in your life who care about you, who you trust. They might work with you now, but perhaps not. Don’t overlook your friends, family, spouse and past co-workers. Tell each person, individually, that you want to know more about the impression you make and what you’re like to work/interact with. Do this over the phone or in-person. Emailing the request doesn’t demonstrate seriousness. Ask the person to schedule a conversation with you. Send your questions in advance, so the person is prepared. 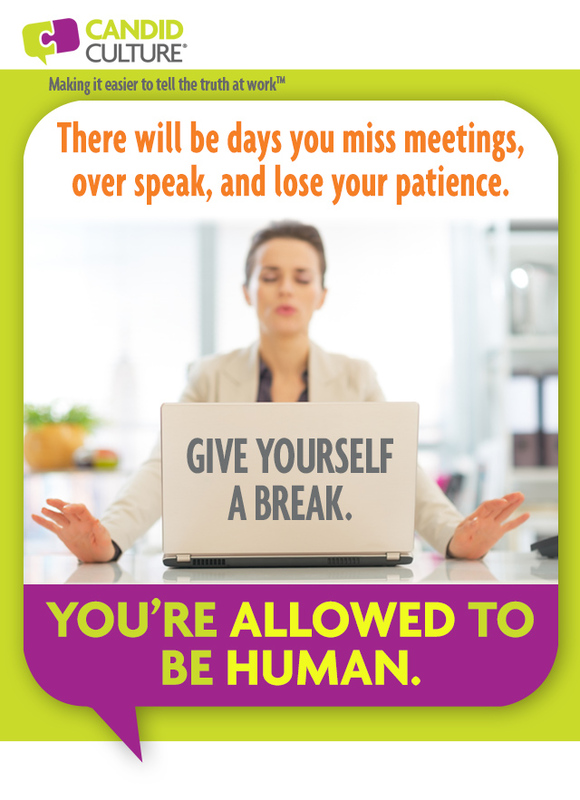 Have the scheduled meeting; don’t cancel it, even if something important comes up. Consider asking: The first impression you make; what you’re like to work/interact with; the best thing about you; and one change you could make. Say, “thank you,” for the information and not more. Don’t underestimate the power of your emotions. Everyone gets defensive when receiving feedback. Defensiveness can be off putting and scary to others. Don’t do anything to limit future feedback. Ask these questions a few times a year. You don’t necessarily need to make any changes, based on what you learned. The point isn’t to act on the information, it’s merely to have it. Information is power, and power is control. You can now choose how to act vs. working in the dark. Unhappy at Work? Know When to Go. A few weeks ago I received an email from a candidate for a job I recently filled. His grammar, in the email, wasn’t great. The job requires writing, so I asked for a writing sample. The writing sample I received was riddled with spelling and grammar errors. When I rejected the candidate, because of his bad grammar and spelling, some of my friends defended the candidate saying that spelling didn’t predict how successful someone would be and that poor writing is incredibly common in this country. Their comments reminded me of the graduate level leadership class I taught a few years ago. Many of my master’s level students’ grammar was so poor, when I handed back my students’ first papers, I gave them a grammar lesson. Some class members were so offended and annoyed by this, they reported me to the dean, telling her that they did not pay $1500 for a grammar lesson. My stand remains the same. I don’t care how great a leader you are. If you discredit yourself in every email you send by using bad grammar, your career will be limited. “A lot” is two words. Incentify is not a word. Incent is. Too means also. To does not. 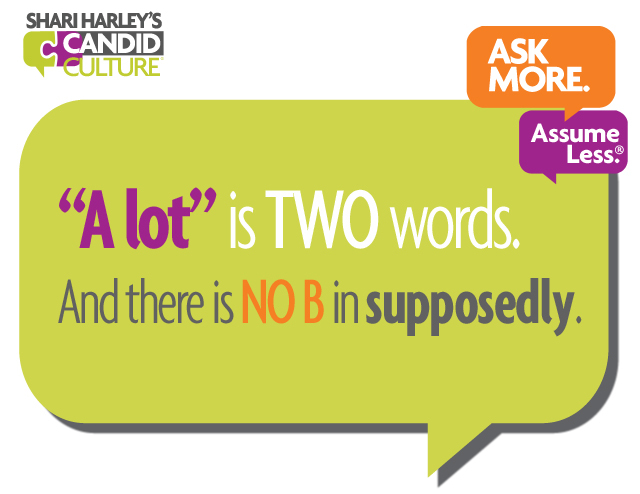 There is no B in supposedly. Your crazy aunt can only visit once a year without you wanting to change your address, and this does not mean that you’re a bad person. You accept advice. You advise others. There is no X in especially. You lose your marbles when you don’t get enough sleep. Your jeans become loose when you stop eating Snickers bars. You accept advice, except when you think the other person isn’t the sharpest tool in the shed. Irregardless is not a word. Regardless is. “Where you at?” “Where are you,” will do. Please put your contact information on the bottom of your initial and reply emails. This is not a grammar thing, it would just be helpful. Call me picky or old school. But I suspect that when you hear these errors made in conversation or see them in writing, you judge the other person. I know most hiring managers do. Hiring managers want to know employees can write reports and email clients without embarrassing the company. You will be eliminated as a job candidate if your resume has typos. People will judge you when you use incorrect English. They won’t tell you they’re judging your bad grammar. They’ll do it quietly or talk about you when you’re not there. I spoke at a conference a few weeks ago where an attendee asked how to tell an employee she was going to be fired because her writing was so poor. She maintained client files and wrote client correspondence. Clients’ names were often wrong, in her written notes, as was spelling and grammar. The typos and grammar errors were a deal breaker. And they may be in your job as well. Have someone proofread a few of your emails and reports, and ask for feedback on your writing. Ask the coworkers you’re close to to tell you when you make grammar errors in meetings. Of course you want them to tell you privately, after the meeting. I write a bi-monthly column for the Denver Business Journal. I’m grateful that my editor reads this blog and emails me the typos and errors I make. I am not exempt. Clean up your bad grammar and your writing, and accelerate your career. I promise it will work.